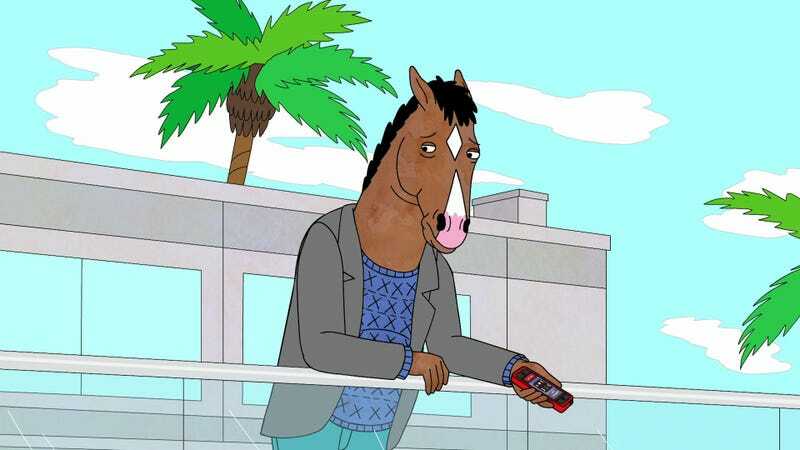 BoJack Horseman is probably the funniest and most harrowing animated series about a horse who used to star in a hit sitcom, but so far only Netflix subscribers have been able to laugh at its ceaseless parade of pun-based humor and weep at its vicious ability to break hearts. According to Variety, though, distributor Debmar-Mercury is now shopping around the syndication rights to the show, meaning reruns might end up somewhere other than Netflix eventually. That’s an extremely rare move for a Netflix show, and it’s all because production company Tornante decided to hold onto BoJack’s off-network rights when it sold the show to the streaming service. As Variety explains, the deal happened years ago, when Netflix was just trying to bolster its ranks of original shows instead of trying to lock down the rights to those shows for all eternity. Now, BoJack Horseman will act as a test to see just how valuable a streaming-only show could be once it stops being streaming-only, which is probably going to be pretty interesting to the sort of people who care about making money off of TV. Netflix, on the other hand, is probably less enthusiastic about this.